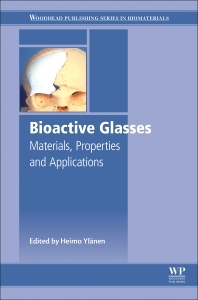 Bioactive Glasses: Materials, Properties and Applications, Second Edition provides revised, expanded and updated content on the current status of this unique material, including its properties, technologies and applications. The book is suitable for those active in the biomaterials and bioengineering field, and includes eight new chapters that cover material types, computational modeling, coatings and applications. Chapters deal with the materials and mechanical properties of bioactive glass and the applications of bioactive glasses, covering their uses in wound healing, maxillofacial surgery and bone tissue engineering, among other topics. With its distinguished editor and expert team of international contributors, the book is an invaluable reference for researchers and scientists in the field of biomaterials, both in academia and industry. Heimo O. Ylänen is Associate Professor at Åbo Akademi University, Finland. Dr. Ylänen is a materials science engineer who obtained his Bachelor and Master’s degree from the Åbo Akademi University, Turku Finland. After obtaining his M.Sc. he worked for 17 years in an international pharmaceutical company before returning to Academia to obtain his Ph.D. In 2004, he was invited to begin as a director of Turku Biomaterials Centre at University of Turku. In September 2008, Ylänen was invited to start as a Professor at the Department of Biomedical Engineering, Tampere University of Technology. He retired from TUT at the end of 2014. Today, he´s working as Senior Academic Advisor in two Finnish start-up companies established on the research results raised during the university research.